Universal Design for Learning is the best way to teach all students effectively but how can a busy teacher get started with UDL right now? 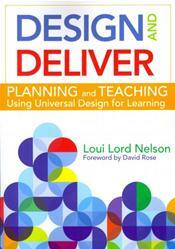 Answers are in this vibrant, research-based guidebook, created by seasoned teacher and former UDL Coordinator Loui Lord Nelson. K-12 educators will learn how to use the three key principles of UDLs Engagement, Representation, and Action & Expressions to present information in multiple ways and meet the needs of diverse learners. Written in first person, like a face-to-face talk with a passionate educator, the book gives teachers a reader-friendly UDL primer and a practical framework for implementation, with detailed guidelines on lesson planning and checkpoints that help them stay on track.